The ritual is complete! "Queen Ariad has adopted a frightful form!" 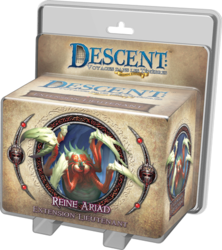 The Lieutenant Queen Ariad miniature spreads terror and darkness in your Descent parts: Journey into the Darkness! This lieutenant expansion also contains the Intrigue "Mortal Canvas" deck of cards, as well as threat tokens, to give the Evil Lord new options and allow him to recruit the dreadful Queen Ariad in any Descent campaign: Travel in the Darkness.